On Monday, July 9, 2018, President Trump announced the nomination of Brett Kavanaugh for a Supreme Court Justice to replace the retiring Justice Anthony Kennedy. Kavanaugh, 53, earned two Yale degrees, including from Yale Law School in 1990. 1. After spending two years as a law clerk, Kavanaugh moved on to a one-year fellowship in the office of U.S. Solicitor General Kenneth Starr with a clerkship for Justice Anthony Kennedy. He would then join Kenneth Starr at the Office for Independent Counsel, where he was a lead author of the 1998 Starr Report to Congress, siting 11 grounds for President William Clinton’s impeachment. 2. For five years, Kavanaugh worked in the West Wing under President George W. Bush, first as counsel to the president, and then as staff secretary to the president. He even married Bush’s longtime personal secretary in 2004. 3. Kavanaugh is currently on the U.S. Court of Appeals for the D.C. Circuit, and was appointed there by President George W. Bush. He was first nominated by Bush for the D.C. Circuit in 2003, but that nomination was stalled in the Senate for almost three years, until he was finally appointed in 2006 by the Senate in a 57-36 vote. 4. He sided with Priests for Life in the contraception case of Priests for Life v. The Department of Health and Human Services. However, conservatives are not pleased that he wrote that the Supreme Court precedent “strongly suggests that the Government has a compelling interest in facilitation access to contraception”; however, there are less “restrictive means of furthering” that interest. 5. In 2017, Kavanaugh famously and temporarily barred a pregnant 17-year-old illegal immigrant from receiving an abortion. That decision was overturned, and Kavanaugh dissented from that order by the D.C. Circuit for the Trump Administration to allow the girl to secure an abortion. However, conservatives are concerned because he did not challenge the undocumented teen’s supposed “right” to have an abortion as D.C. Circuit Judge Karen Henderson did. 6. Kavanaugh is an originalist, which is what Trump is looking for. In 2010, he pointed to American tradition and the original meaning of the Constitution in order to defend prayer at official government ceremonies. Years later, the Supreme Court would follow suit, upholding prayer before a town meeting in New York. 7. 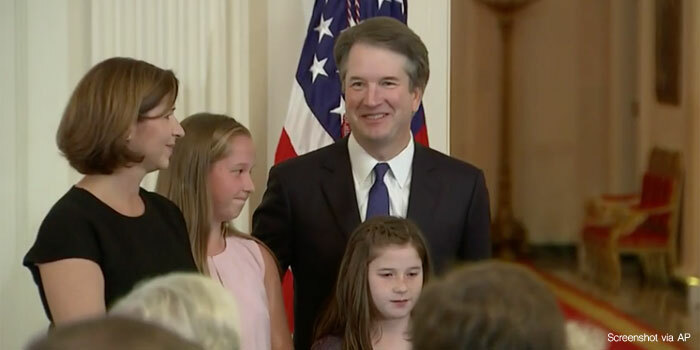 Kavanaugh is Catholic, and has often worked pro bono advocating for religious groups in Supreme Court cases including Good News Club v. Milford Central School and Santa Fe Independent School District v. Doe. He volunteers for Catholic Charities, and he mentors in Catholic schools, as well as coaches his daughter’s Catholic Youth Organization basketball team. All in all, conservatives have mixed feelings about Kavanaugh, with some supporting him, and some believing he isn’t conservative enough. Trump promised to nominate pro-life judges and it seems he did just that with Kavanaugh – especially if he sticks to his originalist rationale of the Constitution and doesn’t consider Roe v. Wade settled law.